The stars of this week’s parasha, Vayeshev, are Joseph and Judah. We are told how the sons of Jacob were envious (and suspicious) of Joseph, and ended up throwing him in a pit, while deliberating what to do with him. Shimon wished to kill him, Judah to sell him, and Reuben to save him. Meanwhile, Midianite merchants found the helpless Joseph and abducted him, later selling him to Ishmaelites who brought Joseph down to Egypt. There, Joseph enters into servitude in the home of a well-to-do Egyptian family. The Torah diverges from this narrative to describe what happens to Judah. Judah marries and has three sons. The elder Er marries Tamar and dies because of his sinful ways, as does the second son Onan after fulfilling the law of levirate marriage and marrying his former sister-in-law. After Judah fearfully avoids another levirate marriage for Shelah, his last son, Tamar seduces Judah and becomes pregnant. She gives birth to twins, Peretz and Zerach. Peretz would go on to be a forefather of King David, and thus a forefather of Mashiach. As is known, there are actual two messianic figures (or two aspects to Mashiach): Mashiach ben David, and Mashiach ben Yosef—one from the line of Judah and one from the line of Joseph. It is therefore in this week’s parasha where the spiritual origins of the two messiahs are laid. Mashiach ben Yosef is the first messiah. He is the warrior that battles evil in the “End of Days”. Unfortunately, he is destined to die in these battles. The Talmud (Sukkah 52a) states how the entire nation will mourn his tragic death. However, it will not be too long before Mashiach ben David arises. As the direct descendant of the royal line, he re-establishes the rightful throne and restores the holy Kingdom of Israel. The Third Temple is built thereafter, and according to some Mashiach ben David reigns for forty years, as did his progenitor King David (Sanhedrin 99a, Midrash Tehillim 15). We have already discussed why Mashiach ben Yosef must die in the past (see ‘Secrets of the Akedah’ in Garments of Light). How he will die is not exactly clear. What will bring him to his death? It appears that Mashiach ben Yosef will be sold out by his own people. This is what happened to one of the earliest prototypes of Mashiach ben Yosef: the Biblical judge Shimshon (Samson). Samson turned himself in voluntarily, but with God’s help smote the Philistine oppressors and freed himself. He would be betrayed again by Delilah, but would manage to defeat the Philistines for good, though at the cost of his own life. Like Mashiach ben Yosef, Samson sacrifices himself. The text above specifically states that three thousand men of Judah came for Samson. What is the significance of this numeric detail? At the Exodus, the Torah states there was a “mixed multitude” (erev rav) of three thousand men among the Israelites. They, too, accepted the Torah at Mt. Sinai, only to instigate the Golden Calf incident forty days later. It is said that the same will happen at the End of Days, with an “erev rav” among the Jews who will instigate all sorts of problems for the nation from within (see, for example, Zohar I, 25 or Sha’ar HaGilgulim, ch. 39). Like Samson’s three thousand men of Judah, Mashiach ben Yosef is sold out by three thousand “Jewish” individuals. And the fact that they are men of Judah is all the more significant. It was Judah in this week’s parasha who proposed selling Joseph. And to whom did he want to sell him? Judah wanted to sell his brother to the Ishmaelites. In speaking of the battles of Mashiach ben Yosef and the End of Days, it is often the Ishmaelites (or the Ishmaelites banded together with Esau) that are implicated (see, for example, Pirkei d’Rabbi Eliezer, ch. 30). Today, of course—quite conveniently—the modern “Philistines” are Ishmaelites, and among their biggest supporters are the descendants of Esau. God originally intended Adam to live 1000 years. Yet, we see in Genesis that Adam lived only 930 years. This is because, as is well known, Adam foresaw that David would be stillborn, and donated 70 years of his life to him. Indeed, David went on to live exactly 70 years. The Arizal saw in the name Adam (אדם) an acronym for three figures: Adam, David, Mashiach. These are the first, middle, and last major figures of human history. Rabbi Yitzchak Ginsburgh stresses that David is supposed to be the literal midpoint of history. If that’s the case, then we only need to see when David lived to calculate the era of Mashiach. The traditional lifetime for David is 2854-2924 AM (Anno Mundi, Hebrew calendar years, corresponding to about 907-837 BCE). To find the time period for the End of Days we must simply multiply David’s years by two. This gives 5708-5848, or 1947/1948-2087/2088 CE. That’s quite amazing, considering that Israel officially became a state in 5708 (the UN vote to create Israel took place in November 1947, and Israel declared independence in May 1948—both dates fall within the Jewish year 5708). And what would be the midpoint, or perhaps the apex, of the “End of Days” period? None other than 5778, the year which we are currently in. This entry was posted in Archaeology & History, Kabbalah & Mysticism, Mashiach & End of Days, Midrash and tagged Adam and Eve, Anno Mundi, Arab-Israeli Conflict, Dan, Delilah, Edom, End of Days, Er, Erev Rav, Golden Calf, History, Ishmaelites, Islam, Jacob, Joseph, Judah, King David, Mashiach, Mashiach Ben David, Mashiach ben Yosef, Messianic Age, Midianites, Midrash Tehillim, Mixed Multitude, Onan, Peretz, Philistines, Prophecy, Rashi, Reuben, Sale of Joseph, Samson (Shimshon), Sanhedrin (Tractate), Sha'ar HaGilgulim, Shelah, Shimon (Simon), State of Israel, Tamar (Genesis), Vayeshev, Zerach, Zohar on December 4, 2017 by Efraim Palvanov. This week’s parasha is Pinchas and begins with God’s blessing to Pinchas for putting an end to the immorality conducted by the Israelite men with the Midianite women. Following this, the Torah describes another census, then the incident with the five daughters of Tzelafchad, the appointment of Joshua to succeed Moses, and ends with a long list of holidays and the sacrificial offerings to be brought on those days. Elsewhere in the Torah, we read that these sacrifices must be brought only in the one specific place God chooses (Deuteronomy 12:11). In the Wilderness, and several centuries after, this place was the Mishkan, the “mobile sanctuary”, or tabernacle. Around the first millennium BCE, King Solomon built a permanent sanctuary in Jerusalem which would be known as the First Temple. After the Babylonians destroyed it, a Second Temple was built on the same spot, and was itself destroyed by the Romans around 70 CE. According to tradition, both destructions occurred following the 17th of Tammuz and culminated on the 9th of Av, hence the period of mourning known as the “Three Weeks” which we find ourselves in now. This is the basic history of the Holy Temple that most are familiar with. In reality, the Temple’s history has many more hidden secrets and intriguing ups and downs. The Talmud (Zevachim 118b) recounts the history of the Mishkan. It was constructed under the leadership of Moses, Betzalel and Aholiab and erected a year after the Exodus. Once in Israel, the Mishkan was in the city of Gilgal for 14 years, during which time the Holy Land was conquered from the Caananites and divided up among the tribes of Israel. Once the conquest was complete, the Mishkan was moved to Shiloh, where it stood for 371 years. Finally, it spent 57 years in the towns of Nov and Gibeon until the Temple was built (480 years after the Exodus, based on I Kings 6:1). The epicentre of the Mishkan was the Holy of Holies, which contained the Ark of the Covenant. However, towards the end of the period of Judges, the Ark was removed from the Mishkan and taken into battle against the Philistines in the hopes of bringing about a miraculous victory. No victory was had; the Israelites were defeated, suffered the deaths of the sons of Eli the Kohen Gadol, Hofni and Pinchas (not to be confused with the Pinchas of this week’s parasha), and lost the Ark of the Covenant to the Philistines. The Ark and the Mishkan would never reunite again. King David later brought the Ark back to Jerusalem and placed it in a special tent, while the Mishkan remained in Gibeon. We see that at this point sacrifices were actually brought in both locations – David brought offerings before the Ark in Jerusalem (II Samuel 6:17), while offerings were also brought on the actual altar in Gibeon (I Kings 3:4). In fact, the Tanakh tells us that before the Temple, people brought offerings and sacrifices in various “high places” across the country (I Kings 3:2), and not just the one place “that God chooses”. It was King Solomon who first attempted to centralize the sacrificial rituals in Jerusalem. Not surprisingly, people continued to offer sacrifices across the country instead of trekking all the way to the Holy City. Following Solomon’s death and the split of the kingdom in two, Jeroboam (king of the northern, “Israelite” kingdom) built two more temples – in the cities of Dan and Beit-El. These two temples quickly turned idolatrous, with Golden Calves being the centre of worship. The Temple in Jerusalem also turned idolatrous shortly after, with worship of Asherah trees being particularly common (I Kings 14:23, II Kings 21:7). The Talmud (Yoma 9b) tells us that it was primarily because of this idolatry that the Temple was destroyed. 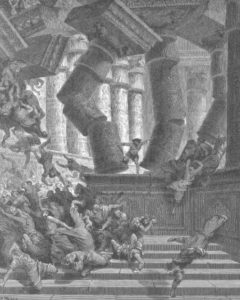 While everyone knows how the Temple was destroyed by the Babylonians, it was actually sacked and emptied out long before that. Just five years after Solomon’s death, the people of Judah descended into so much idolatry that God sent the Pharaoh Shishak (or Sheshonq) against them. Shishak took away all of the gold and treasure from the Temple, and King Rehoboam (Solomon’s son) replaced what he could with essentially brass replicas (I Kings 14:25-28). So, the First Temple only lasted with all of its original holy vessels for about 35 years, since it was completed in the 11th year of Solomon’s 40-year reign (I Kings 6:38). For its remaining three and a half centuries, it was only a hollow shell of Solomon’s Temple, with counterfeit vessels, and lengthy periods of rampant idolatry. 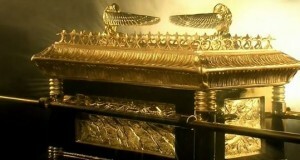 Meanwhile, the Ark of the Covenant appears to have been taken by Shishak as well, since it is no longer mentioned in the Tanakh, except for one reference in II Chronicles 35:3, which describes how Josiah purified and rebuilt Solomon’s Temple. The corresponding passage in II Kings 23 does not mention the Ark. Some suggest that Solomon hid the original Ark somewhere in the Temple Mount, knowing that the kingdom would fall apart after his death. Josiah brought the Ark back from this secret location temporarily, before hiding it again so that the Babylonians could not carry it away (Keritot 5b). Some believe the original Ark is still hidden away deep below the Temple Mount. Soon after the destruction of the First Temple, the Persians conquered the Babylonians, and Cyrus the Great permitted the Jews to return to Israel and rebuild their temple. When they came (about 50,000 altogether), the Jews met resistance by the Samaritans. These people claimed to be the original Jews that remained behind while the majority of Jews were taken to Babylon (and Assyria before that). The Babylonian Jews claimed that the Samaritans were imposters, foreigners from another land that were settled in Israel by the Assyrians. The Talmud calls them Kutim, from the place in Iraq where they are said to have originated. The Samaritans had their own temple erected on Mt. Gerizim, which they consider the original holy mountain (as opposed to Mt. Moriah, where the temples stood). The Samaritans resisted the new Jewish arrival, and prevented them from rebuilding the Jerusalem temple for a while. Ultimately, the Second Temple was built, and the Samaritans would slowly be forgotten. A small number still exist today, and hold on to their traditional beliefs. They still claim to be the original Israelites and “Guardians of the Ark”, and insist that Mt. Gerizim is the holy mountain. Archaeological evidence shows that an elaborate temple dedicated to Hashem did exist on Mt. Gerizim as far back as the 5th century BCE. The temple was destroyed around 128 BCE by the Maccabee warrior-king and high priest John Hyrcanus (Yochanan Hurkanus), the son of Simon the Maccabee, and grandson of Matityahu, the original leader of the wars with the Syrian-Greeks, as commemorated during Chanukah. At the same time, two more temples were erected by Jews outside of Israel. In 1967, archaeologists discovered a Jewish temple in Egypt, on the island of Elephantine (modern-day Aswan). In the middle of the first millennium BCE, Elephantine had a large Jewish population. 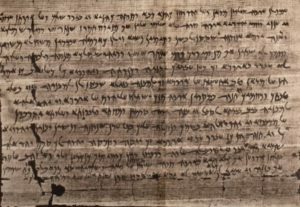 Various papyri have been found there, among them a letter to the governor of Judea to help rebuild the Elephantine temple. It is not certain when this temple was first constructed. After the Kingdom of Judah was destroyed, many Jews fled to Egypt (with the prophet Jeremiah reluctantly joining them) to avoid the Babylonians. It is possible that they built this temple instead of the Jerusalem temple. It is also possible that this temple was built alongside the Second Temple during the early Persian period. The Elephantine temple was gone by the middle of the 4th century. Some time later, another Jewish temple was built in Egypt, in Leontopolis. We know far more about this temple, since it is mentioned by historical sources like Josephus, and is even mentioned in the Talmud. It was built in the 2nd century BCE by a kohen named Onias (Chonio), the son of Simon the High Priest. The Talmud (Menachot 109b) says this was Shimon HaTzadik, and gives two accounts as to what happened. In one account, Shimon appointed his son Onias to take his place before his death, but his older brother Shimi wrested the high priesthood from him, so Onias fled to Alexandria and built his own temple. This was in fulfilment of Isaiah’s prophecy: “In that day shall there be an altar to the Lord in the midst of the land of Egypt” (Isaiah 19:19). Josephus suggests the Leontopolis temple stood for as long as 343 years, and was a centre of sacrifices and offerings. The great Jewish philosopher Philo offered sacrifices there, in addition to the Jerusalem Temple. It appears that in those days it was common to worship God at both temples! Indeed, the Romans were aware of this, and when the Second Temple in Jerusalem was destroyed, Vespasian gave the order to destroy the temple in Leontopolis as well. The order was carried out in 73 CE, putting an end to Jewish sacrificial services. Since then, Jews have been waiting for a Third (Jerusalem) Temple. However, as we’ve written before, it is highly unlikely that this Temple will offer any sacrifices. Instead, it will be a holy gathering place of unity, peace and prayer; a place for deeper contemplation, meditation, inspiration, and elevation. It will be, as many sources suggest, an eternal edifice that will not have to be built by man at all, but will descend miraculously from Heaven. May we merit to see it soon. This entry was posted in Archaeology & History, Mysteries & Origins and tagged 17th of Tammuz, 9th of Av, Aholiab, Alexandria, Ark of the Covenant, Asherah, Assyrians, Aswan, Babylonian Captivity, Babylonians, Beit-El, Betzalel, Canaanites, Chanukah, Dan, Elephantine Papyri, Elephantine Temple, Eli HaKohen, First Temple, Gibeon, Gilgal, Golden Calf, Hofni, Holy of Holies, Idolatry, Iraq, Jeremiah, Jeroboam, Jerusalem, John Hyrcanus, Josephus, Josiah, King David, King Solomon, Kingdom of Israel, Kingdom of Judah, Kutim, Leontopolis Temple, Maccabees, Matityahu, Mishkan, Mt. Gerizim, Mt. Moriah, Nov, Onias, Persians, Pharaoh, Philistines, Philo, Pinchas, Pinchas ben Eli, Rehoboam, Romans, Samaritan Temple, Samaritans, Second Temple, Shiloh, Shimon HaTzadik, Shishak, Simon Maccabee, Simon the High Priest, Tabernacle, Temple, Third Temple, Three Weeks, Tzelafchad, Vespasian on July 27, 2016 by Efraim Palvanov. Of the three patriarchs, the holiday of Passover is most intimately tied to Isaac. According to tradition, Isaac was born on Passover. Commenting on Genesis 18:10, Rashi explains that the angels’ visit to Abraham and Sarah occurred on Passover, and the angels promised a son to be born – Isaac – exactly one year from that time. This important detail helps to solve a key chronological problem. Earlier, God had told Abraham that his offspring would be subjugated for 400 years. However, when one makes an accounting of the timeline, they will find that the Jews were only in Egypt for a total of 210 years! How could this be? Commenting on that verse (Genesis 15:13), Rashi calculates how the Exodus occurred exactly 400 years from the birth of Isaac. Thus, God’s word was perfectly fulfilled, since Isaac was the very first of Abraham and Sarah’s offspring. Although Isaac was not subjugated in the sense that the Jews in Egypt were, nonetheless he was certainly troubled by the Canaanites and Philistines, as the Torah records, and was considered a “foreigner” in the Holy Land throughout his life, since God had not yet officially granted the land to the Jews, nor did Isaac settle it permanently. Digging further, if Isaac was born on the first day of Passover, then his brit milah (circumcision) would have been on the eighth day of Passover. Though the eighth day is not celebrated in Israel, it is celebrated in the diaspora. According to Chassidic custom, as initiated by the Baal Shem Tov (the founder of Chassidism) the eighth day of Passover is associated with Mashiach. In fact, it is customary to hold a Seudat Mashiach, a “Mashiach Feast” on the final afternoon of the holiday, complete with matzahs and four cups of wine. Just as Passover celebrates the First Redemption (led by Moses), the last day of Passover is meant to represent the Final Redemption (led by Mashiach). And it is only commemorated in the diaspora since, after all, it is diaspora Jewry that needs the Final Redemption and the Ingathering of the Exiles more than anyone. Finally, during the Pesach seder we have three matzahs to go along with the Pesach platter. It is taught that these three matzahs represent the three patriarchs: Abraham, Isaac, and Jacob. One of the fifteen steps in the seder is yachatz, where the middle of the three matzahs is broken in half. The larger half is covered and hidden as the afikoman, while the smaller half remains at the seder table. Thus, the matzah which we break is specifically the one associated with Isaac. So then, what is the deeper connection between Mashiach and the Redemption, Passover and the Afikoman, and the forefather Isaac? The Jewish mystics teach that there are actually two messiahs: Mashiach ben Yosef, and Mashiach ben David. This is derived from a number of texts and principles. One of these is the fact that the Tanakh has a clear pattern when it comes to major national events: first comes a descendant of the matriarch Rachel to usher it in, and then comes a descendant of the matriarch Leah to complete the mission. For example, Yosef (a son of Rachel) came to Egypt first to set the stage, and then came Yehuda (a son of Leah) to prepare the land for the actual arrival of the rest of the family (see Genesis 46:28). First, Joshua (of the tribe of Ephraim, and a descendant of Rachel) brought the Jews into the land of Israel following the Exodus, then Othniel (from the tribe of Yehuda) finished the job of conquering and settling the land. The first king of Israel was Saul (from the tribe of Benjamin, and a descendant of Rachel) and only then came King David (again of Yehuda). Thus, in every major event, we see clearly that first comes a descendant of Rachel to prepare the way and fight the battles, and only afterwards comes a descendant of Leah to finish the job. In the same way, the Sages teach that first comes Mashiach ben Yosef (a descendant of Rachel), whose mission is to fight all the battles on behalf of Israel, and only after this comes Mashiach ben David (a descendant of Leah), who completes the messianic role. And who is Mashiach ben Yosef? Amazingly, the Sages say that this is none other than Isaac, reincarnated! Of all the patriarchs and major Torah figures, Isaac is spoken of the least in Scripture. Hardly anything is said of him. It is explained that this is because Isaac has not completed his mission, and his story is not over. He has yet to fight many battles. The Sages permute his name – Itzchak (יצחק) – into the words Ketz Chai (קץ חי), literally that he “will live [again] at the End”. This is one reason why Itzchak (which means “will laugh”) is in the future tense. Isaac is Mashiach ben Yosef, who will come at the End to fight the final battles. Beautifully, the gematria of Itzchak (יצחק) is 208, equivalent to Ben Yosef (בן יוסף), also 208. This brings us back to Passover and the afikoman. The middle matzah is broken in half. One half – the one associated with the patriarch Isaac – remains on the seder plate, together with the other matzahs that symbolize the other patriarchs. The other half – the larger one – is hidden away, only to be revealed at the very end. This is symbolic of Isaac’s final role as that of Mashiach, whose arrival is also concealed until the very ‘End of Days’. And on the eighth and final day of the Passover holiday – the day on which Isaac was circumcised and entered into the Covenant – we hold a ‘Mashiach Feast’ to celebrate the coming Final Redemption, may it arrive speedily and in our days. This entry was posted in Holidays, Mashiach & End of Days and tagged Abraham, Afikoman, Angels, Baal Shem Tov, Benjamin, Biblical Chronology, Brit Milah, Canaanites, Chassidism, Circumcision, Egypt, End of Days, Ephraim, Gematria, Genesis, Isaac, Jacob, Joseph, Joshua, Judges, King David, Leah, Mashiach, Mashiach Ben David, Mashiach ben Yosef, Mashiach Feast, Matzah, Moses, Othniel, Passover, Philistines, Rachel, Redemption, Reincarnation, Sarah, Saul, Seder, Yachatz, Yehuda on April 9, 2015 by Efraim Palvanov.